A group of Satanists recently filed a lawsuit against Netflix and Warner Bros for "falsely" depicting their goat-headed idol, Baphomet, in the new spin-off of "Sabrina the Teenage Witch." The Salem, Massachusetts-based Satanic Temple is suing the entertainment companies for $50 million for depicting its Baphomet statue in four episodes of the series, "The Chilling Adventures of Sabrina." The lawsuit, filed in a federal court in New York on Thursday, claims Baphomet's appearance on the series is copyright infringement, trademark violation and constitutes misappropriation, and "confusion of origin and injury of reputation," the U.K. Telegraph reported. "Importantly, these original expressions are misappropriated through use of an obvious copy which is featured prominently throughout the 'Sabrina' series and the central focal point of the school in the 'Sabrina' series which represents evil antagonists," said the complaint filed in the U.S. District Court for the Southern District of New York. "What makes this case particularly striking and significant is that it arises in the context of Defendants who are highly sophisticated media production and distribution companies which blatantly misappropriated Plaintiff's unique expression of an idea even though they have a long history of vigorously protecting their own intellectual property," the suit continued. The suit goes on to say that one of the reasons the Satanic Temple created the goat-headed image was "to promote First Amendment values of separation of church and state and equal protection." The Christian Post has reported on several controversies surrounding the Satanic Temple's Baphomet statue. You can read those reports here, here and here. "The Chilling Adventures of Sabrina" features their version of the statue when Sabrina (Kiernan Shipka) is forced to make a decision on whether to join her family's devil-worshiping church and sign her name in the "Dark Lord's Book," which would take away her free will. Neither Netflix nor Warner Bros. have commented on the lawsuit. 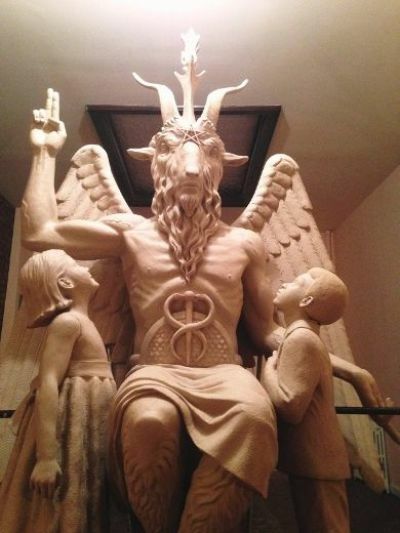 Lucien Graves, founder of the Satanic Temple, said last week in a tweet: "Yes, we are taking legal action regarding #TheChillingAdventuresofSabrina appropriating our copyrighted monument design to promote their asinine Satanic Panic fiction." Following that message, he shared a comparison of the statues on Twitter with the original idol versus the show's version.